The United States has announced that it is forging new and renewed security partnerships and will partner with Australia in a joint initiative to development a new naval base to be built in Papua New Guinea’s Manus Island. US Vice President Mike Pence said they will work with PNG and other Pacific Island Nations to protect the sovereignty and maritime rights. 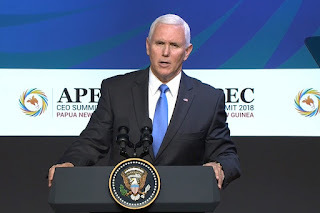 “The United States of America will continue to uphold the freedom of the seas and the skies which are so essential to our prosperity,” Pence said. He said at the APEC CEO’s meeting in Port Moresby that they will work in partnership with Australia to expand the Lombrum Naval Base in Manus.